In January of 1921*, the Dept. of Commerce issued a broadcasting license to The Electrical Equipment Company, 42 North West 4th Street, Miami, FL. The auto and radio sales/service company was owned by W.W. Luce. His new station, WQAM, was authorized to operate with 250 watts on 833 kHz. WQAM was the southernmost broadcasting station in the U.S. For whatever reason, within a few brief months, WQAM had cut its power back to 100 watts. In those days the government was driving stations crazy by constantly reorganizing their frequency assignments. 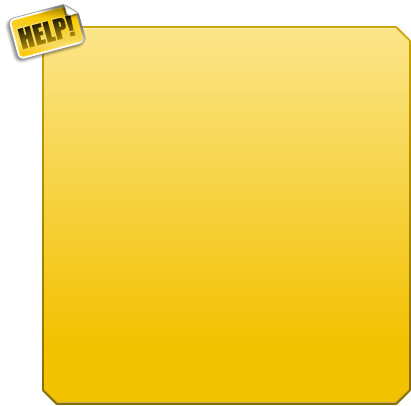 This was the Dept. of Commerce's inept attempt at dealing with the rapidly expanding service, though regulations governing broadcasting were virtually non-existent. By early 1924, the government relocated WQAM to 1140 kHz, but by July they again ordered a move to 1000 kHz. By the end of 1924, the station had been told to shift to 1120 kHz, only to be sent back to 1140 kHz in July, 1925. By that time, WQAM was calling itself the 'Pioneer Broadcast Station of Florida." Stations were not universally pleased with their newly mandated frequency reassignments. During this period of no radio regulation, it was a common practice for stations to ignore federal assignments and simply use their own favorite channels. 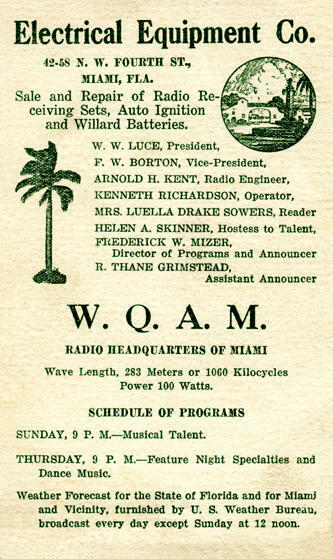 In November of 1925, WQAM reportedly ``jumped" to the unauthorized frequency of 1050 kHz, using 1 kW, though still authorized for 1140 kHz with 100 watts. WQAM was still Miami's only year-round broadcaster because WIOD-WMBF shut down during the summer. In the spring of 1927, the newly-formed Federal Radio Commission assigned WQAM to 930 kHz, permitting the station to operate with 750 watts. By November, WQAM was shifted to 780 kHz. 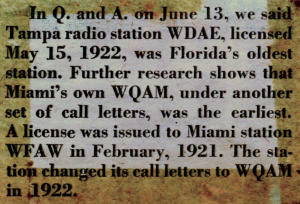 In late 1928, WQAM was moved to 1240kHz. By early 1929, the new licensee became the Miami Broadcasting Company. They increased the power to 1 kW and moved the studios to Miami's Postal Building, 327 North East First Avenue. The Western Electric transmitter was relocated to the fifteenth floor of the Realty Board Building, 600 Biscayne Blvd. When these changes were completed, WQAM shifted its dial position to 560 kHz. In January of 1932, WQAM's transmitter was moved to the top of the Miami Daily News Building. In 1938, it was again moved to the water's edge at Biscayne Bay and 14th Street, where a new 224-foot self-supporting Blaw-Knox vertical was installed. The station's slogan became 'The Voice of Tropical America." 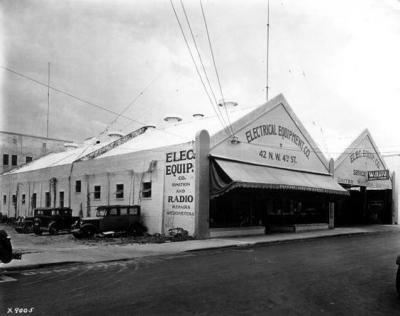 In 1941, WQAM received a permit to increase its daytime power to 5 kW, and this was completed in November of 1943 with the addition of a Continental 315-B transmitter. In 1947, a new 380 foot tall Lehigh self-supported vertical radiating antenna tower was installed on a pier extending out into Biscayne Bay at 1425 North East Bayshore Ct.,just south of the Venetian Causeway's Miami terminus. In 1949, WQAM's studios were moved to Suite 1723, Alfred I. DuPont Building, in downtown Miami. In 1956, the station was sold to Todd Storz' Mid-Continent Broadcasting Co., later to become known as the Storz Broadcasting Co. The studios and offices were moved in 1962 to the Mezzanine floor of Miami's McAllister Hotel. A permit was also issued that year to change the transmitter site. In 1965, the station's main studio was relocated to 767 41st Street, Miami Beach. The studios remained there until 1985, when they were relocated to 9881 Sheridan Street, Hollywood, FL. In early 1988, the transmitter was moved to a new site near Miami and commenced AM stereo operation. The old 5 kW Continental transmitter was put up for sale. WQAM had been running a Country Music format, but in 1990, the station added Oldies and Sports Talk. The Country Music format was dropped (though was continued over the FM outlet, WKIS, at Boca Raton). The Oldies Music lasted until 1993 when the format was changed to all-sports, and the station became known as ``Sportsradio 560." In mid-1996 the station (along with WKIS) became the property of the Sunshine Wireless Co. As "Sportsradio 560," WQAM operates full time on 560 kHz, 5 kW days, 1 kW at night (non-directionally) from its studios in Hollywood. It is still licensed to nearby Miami. 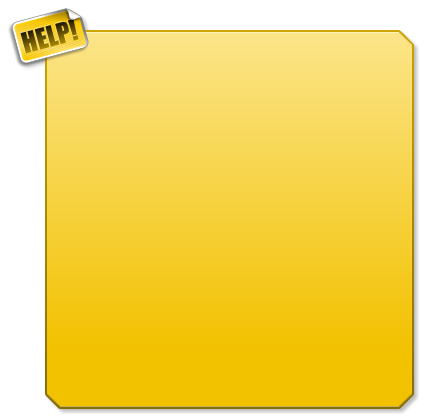 Thanks to Broadcast Pro-File for permitting us to excerpt information from their lengthy report on WQAM. BP-F is a commercial research service that can provide highly detailed historic reports on all U.S. AM/FM stations, past/present. A reasonable fee is charged for their services. For their complete catalog, send $1 to Broadcast Pro-File, 28243 Royal Road, Castaic, CA 91384-3028. 1. * In the article, the year was printed as 1923. The year should be 1921. Ray Meyers has a copy of the original license which shows 1921. Also, WQAM celebrated it's 50th anniversary in 1971 which would make the original year 1921 and the “WQAM Sale to Storz” article gives the date as 1921. A newspaper article confirms the 1921 date (Right), 2. E-mail received from Ray Meyers on Sept. 4, 2003: “I was reading your page on WQAM history. I have a fair quality copy of WQAM's original license which was issued to Miami Electric in 1921 not 1923. If you know Mitch Wein with Coast, he can also verify this. The reference to WQAM's move to the Miami Daily News tower was probably that of WQAM-FM which was last on 94.9 MHz. Before the tower was renovated just before hurricane Andrew, there had been an old FM broadcast antenna side mounted to the top of the building. I believe that might have been one for WIOD-FM however. 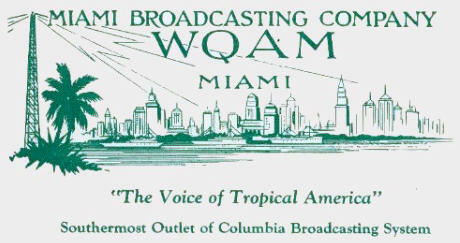 WQAM-FM was at the time owned by the Miami Herald and for the few years it lasted was used to deliver the "Newspaper Of The Air" service by an early fax system to homes of the area's wealthy. WQAM-FM went dark by the mid-fifties just before Todd Storz bought the AM. In 1962, Arthur Zucker, the station manager for WINZ, received a license for 94.9 and built WAEZ the areas first full time stereo ez listening station. The station was later sold to Ed Winton and became WOCN-FM and then sold again to Gannett and became WINZ-FM. Its now owned by Clear Com and resides in a building complex just inside the Broward County line with eight other stations.” -- Ray Meyers 3. A former board op at WQAM has advised me of another error in the above article: Sunshine Wireless purchased the station in 1985, then sold it to Beasly Broadcasting in 1996. In January of 1921*, the Dept. of Commerce issued a broadcasting license to The Electrical Equipment Company, 42 North West 4th Street, Miami, FL. The auto and radio sales/service company was owned by W.W. Luce. His new station, WQAM, was authorized to operate with 250 watts on 833 kHz. WQAM was the southernmost broadcasting station in the U.S. For whatever reason, within a few brief months, WQAM had cut its power back to 100 watts. In those days the government was driving stations crazy by constantly reorganizing their frequency assignments. This was the Dept. of Commerce's inept attempt at dealing with the rapidly expanding service, though regulations governing broadcasting were virtually non- existent. By early 1924, the government relocated WQAM to 1140 kHz, but by July they again ordered a move to 1000 kHz. By the end of 1924, the station had been told to shift to 1120 kHz, only to be sent back to 1140 kHz in July, 1925. By that time, WQAM was calling itself the 'Pioneer Broadcast Station of Florida." Stations were not universally pleased with their newly mandated frequency reassignments. During this period of no radio regulation, it was a common practice for stations to ignore federal assignments and simply use their own favorite channels. In November of 1925, WQAM reportedly ``jumped" to the unauthorized frequency of 1050 kHz, using 1 kW, though still authorized for 1140 kHz with 100 watts. WQAM was still Miami's only year-round broadcaster because WIOD-WMBF shut down during the summer. 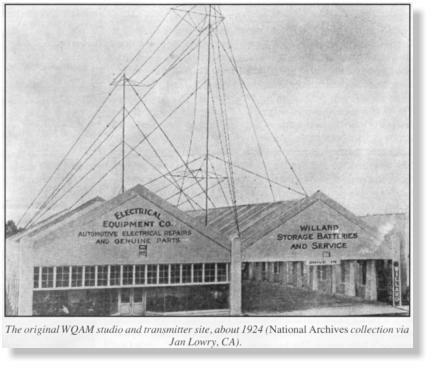 In the spring of 1927, the newly-formed Federal Radio Commission assigned WQAM to 930 kHz, permitting the station to operate with 750 watts. By November, WQAM was shifted to 780 kHz. In late 1928, WQAM was moved to 1240kHz. By early 1929, the new licensee became the Miami Broadcasting Company. 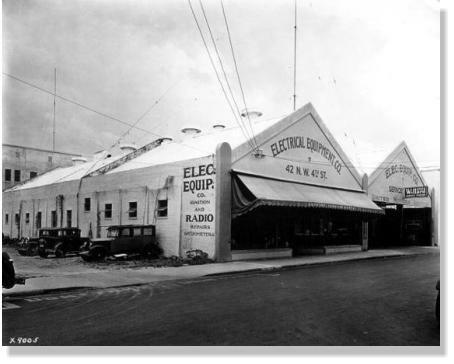 They increased the power to 1 kW and moved the studios to Miami's Postal Building, 327 North East First Avenue. The Western Electric transmitter was relocated to the fifteenth floor of the Realty Board Building, 600 Biscayne Blvd. When these changes were completed, WQAM shifted its dial position to 560 kHz. In January of 1932, WQAM's transmitter was moved to the top of the Miami Daily News Building. In 1938, it was again moved to the water's edge at Biscayne Bay and 14th Street, where a new 224- foot self-supporting Blaw-Knox vertical was installed. The station's slogan became 'The Voice of Tropical America." In 1941, WQAM received a permit to increase its daytime power to 5 kW, and this was completed in November of 1943 with the addition of a Continental 315-B transmitter. In 1947, a new 380 foot tall Lehigh self-supported vertical radiating antenna tower was installed on a pier extending out into Biscayne Bay at 1425 North East Bayshore Ct.,just south of the Venetian Causeway's Miami terminus. In 1949, WQAM's studios were moved to Suite 1723, Alfred I. DuPont Building, in downtown Miami. In 1956, the station was sold to Todd Storz' Mid-Continent Broadcasting Co., later to become known as the Storz Broadcasting Co. The studios and offices were moved in 1962 to the Mezzanine floor of Miami's McAllister Hotel. A permit was also issued that year to change the transmitter site. In 1965, the station's main studio was relocated to 767 41st Street, Miami Beach. The studios remained there until 1985, when they were relocated to 9881 Sheridan Street, Hollywood, FL. In early 1988, the transmitter was moved to a new site near Miami and commenced AM stereo operation. The old 5 kW Continental transmitter was put up for sale. WQAM had been running a Country Music format, but in 1990, the station added Oldies and Sports Talk. The Country Music format was dropped (though was continued over the FM outlet, WKIS, at Boca Raton). The Oldies Music lasted until 1993 when the format was changed to all-sports, and the station became known as ``Sportsradio 560." In mid-1996 the station (along with WKIS) became the property of the Sunshine Wireless Co. As "Sportsradio 560," WQAM operates full time on 560 kHz, 5 kW days, 1 kW at night (non-directionally) from its studios in Hollywood. It is still licensed to nearby Miami. Thanks to Broadcast Pro-File for permitting us to excerpt information from their lengthy report on WQAM. BP-F is a commercial research service that can provide highly detailed historic reports on all U.S. AM/FM stations, past/present. A reasonable fee is charged for their services. For their complete catalog, send $1 to Broadcast Pro-File, 28243 Royal Road, Castaic, CA 91384-3028.